Each package deal highlights a different producer, region, or taste sensation. 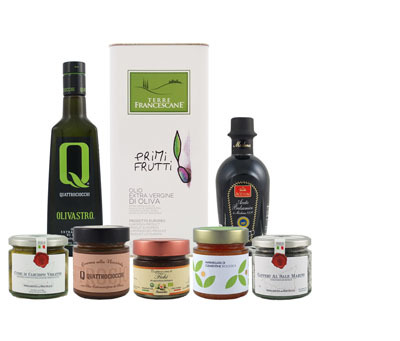 Explore the world of fine oils and gourmet foods at a discounted price. We are the bridge between tens of thousands of consumers and the world’s best olive oil producers. Learn more about your favorite producers, their estate, their company history and production methods. The first ever and (so far) the only olive oil expert to achieve a perfect score in the prestigious Savantes Skills Test. Learn about the 8 reasons why you should choose us for all your olive oil needs. WARNING! Your account has been temporarily suspended. Please contact us to reinstate your account. Expected arrival date is 12/7/2018. Available for pre-order. Oro Bailen Pearls are the newest addition to the award-winning line of extra virgin olive oil products from renowned Spanish producer, Galgón 99. Made from the Oro Bailen’s award-winning Arbequina olive oil, these edible “pearls” are an excellent way to not only add a colorful “pop” of flavor, but to create a stunning presentation when added to a dish - a surefire dinner conversation! These unique pearls have high thermal stability and can withstand temperatures up to 210° F. This strength and stability allow the product to be added to other foods without damaging the capsule, making it ideal for dressing any dish, whether hot or cold, from vegetables to soups, to meat or fish and particularly oysters. Fluctuations in temperature and/or air pressure during transportation may cause indentation of the tin packaging due to expansion and contraction of the oil inside. This is more likely to occur in the warmest and coldest months during which time approximately 5% of tin shipments are affected. Indentations of the tin will not affect the quality of the oil inside. Located in the town of Villanueva de la Reina in the province of Jaen, Oro Bailen is sited in the province's Sierra Norte in the foothills of the Sierra Morena, a Mediterranean forest full of a wide variety of flora and fauna. Owned and operated by the Gálvez-Gónzalez family, they are able to oversee the various phases of production, providing full traceability, from the formation of the fruit on the tree to the final packaging, ensuring an excellent quality product. Why Buy Olive Oil Online? It is a proven fact that in just eight hours of close exposure to strong fluorescent lights, a bottle of olive oil packed in a clear glass bottle will be totally destroyed having lost its color, flavors and aromas. While oil packed in a dark glass bottle offers considerably better protection, it too becomes vulnerable when exposed to strong light and can be completely destroyed in less than a week, which makes purchasing olive oil in a supermarket a less than desirable prospect. Beyond that, the vast majority of the oils sold in the USA have inadequate or even misleading labels. The consumer is given little to no information as to where the oil was actually produced or from what variety of olives it was made, but most importantly, WHEN the oil was harvested. What Are Some Of The Best Olive Oils? Simply put, the best olive oils are extra virgin olive oils. However, adulteration of extra virgin olive oil is a hot topic in the past and present, and many studies continue to examine the contents inside a bottle of olive oil. This problem still persists in the industry, especially at the supermarket level. That's why we created Olive Oil Lovers: to bring some of the world's best olive oils from the most trusted producers to the U.S. market. All of our producers are quality driven in their manufacturing practices. We also conduct an intensive screening of every producer and product on our site - often visting their estates and seeing their practices first-hand - and accept only producers who meet our high standards. To go the extra mile, all of our imported oils are proven extra virgin through chemical analysis in accordance to strict European Union regulations. Therefore, you can trust that any oil you purchase with us at Olive Oil Lovers will be genuine, 100% extra virgin olive oil. How Long Will Olive Oil Last After The Harvest Date? There are two dates that producers may choose to print on a bottle, using either one or both. The "Use By" date is what our producers put on their products to say, "use when at its freshest quality." The taste and quality of the oil doesn't typically diminish over time though, unless it's open and exposed to oxygen. The "Harvest Date" is when the olives for the oil were actually picked and crushed. This date can be any time between late October to mid-December for the Northern Hemisphere, and these new harvest olive oils begin to arrive in the United States in February and March the following year. For oils from the Southern Hemisphere, from countries such as Chile or South Africa, harvest occurs any time between late April to mid-June. When Is Olive Oil Considered Past its Prime? While this answer can vary depending on the olive variety, time of harvest, and how the product is stored, in general an extra virgin olive oil will retain much of its flavor and aromas for 18-30 months in an unopened container. However, any exposure to light and/or oxygen will begin to degrade the oil. Once opened, olive oil should be consumed ideally within 1-2 months, with a maximum of perhaps 4-6 months. When purchasing a 3L or 5L tin, if the oil is typically not consumed within this timeframe, we recommend decanting the oil into smaller, sealed containers and storing in a cool, dark place. Olive oils with higher polyphenol counts will have a longer shelf-life. Higher polyphenol numbers are the result of both the olive variety and when the olive was harvested. Green olives harvested early in the season produce less oil, but have higher polyphenol counts than oils from ripe olives. You can find the polyphenol counts for many of our extra virgin olive oils listed on their product page. A balanced fruity Arbequina olive oil from Spain's Oro Bailen. A gift box with two outstanding mono-varietal olive oils from Spain. Pressed from 100% Spanish Picual olives. Great for gifts! Pressed from 100% Spanish Arbequina olives. Great for gifts!